Similar to other PhD students in behavioural ecology, I spend months in the field and have to sort out the various and inevitable problems that come with remote fieldwork. Our supervisors trust us to do a good job of keeping the project going and getting all the necessary data. They cannot really keep a heavy hand on us – email correspondence is about the only way of managing contact. Except when you hear the words, casually dropped, “I am coming to the field.” This almost always strikes fear into the heart of a student. What are they going to think about the progress I made? Will they agree with the way I sorted out some of the problems? Would they have done things in a similar way? Will they be happy? Approaching my seventh month in the field, I was anticipating the excitement of the breeding season that was expected to be in full swing by the time I arrived. Judging by the number of insects flying into my face and up my shirt, I did not think we were experiencing a drought. However, my worst fears came true…there was no evidence of breeding, and no pups! This is definitely not a good sign for someone whose PhD is based on paternal care. The extreme conditions and apparent food shortage (?!) have had a detrimental effect on the foxes’ attempts at successfully producing pups this year. Whatever the reasons might be, I needed some guidance, and the remoteness of our study site has made contact with the outside world challenging to say the least. I was actually relieved to hear my supervisor was planning on dropping by. Maybe she could steer things in a better direction. We had endless discussions on potential solutions to my dilemma… As part of such a new project, I was a little restricted in terms of finding new angles within the range of data we have collected so far. We finally settled on the “simplest” solution — I would include home ranges and marking behaviour, mediated by hormones, in my thesis. 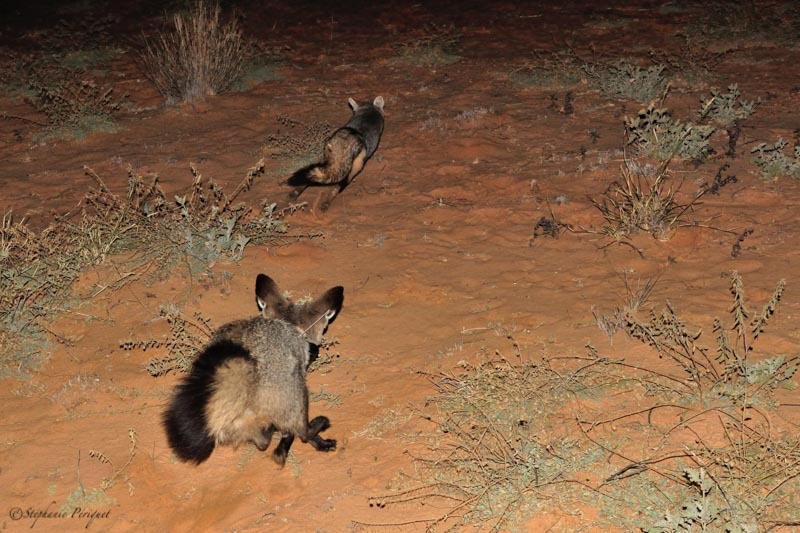 Of course, this easy answer now meant I have to follow foxes for the entire night in order to get a better idea of the distances these little guys travel. I started to prepare for endless long nights in the field. And then it happened… one of our vixens, Bertha, took me to a secret den, where I found our first three (and so far, only) pups of the season. The excitement was tangible, even if I was abashed at being ‘out-foxed’ by the apparently virginal Bertha for a while. Of course, my supervisor left just after this wonderful event, and the problems are lining themselves up yet again. 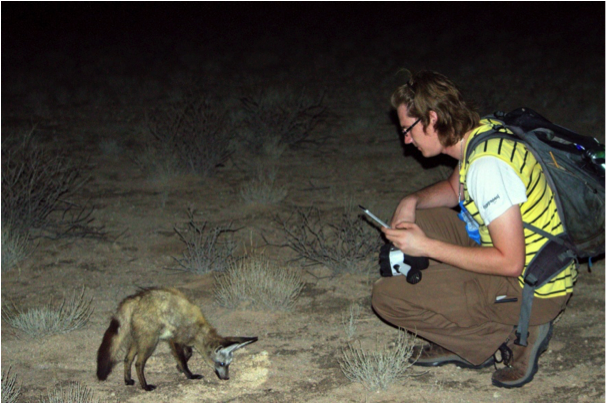 We’re doing full-night focals to collect that extra data. 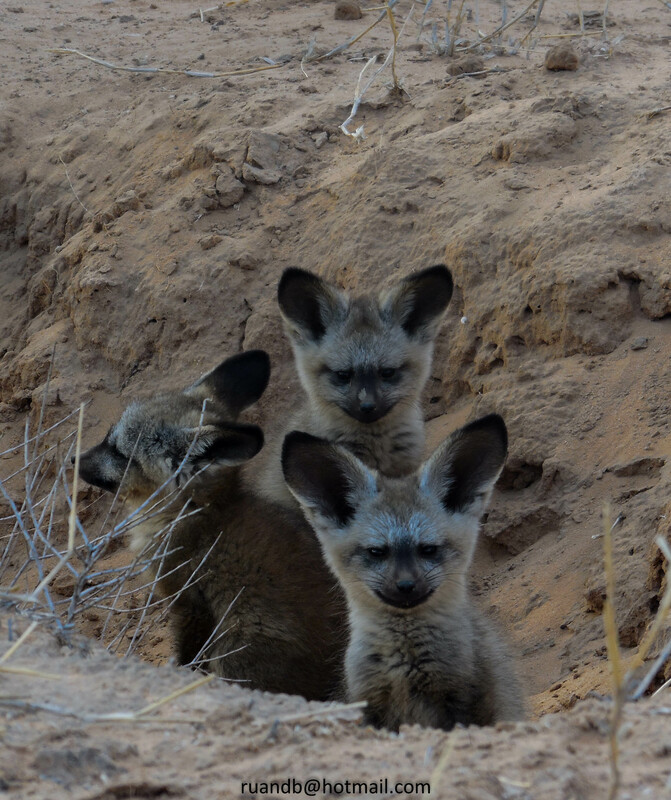 But very, very soon, we will be able to follow the first ‘project’ pups in our nightly observations. And we remain at the combined mercy of fickle Mother Nature and technology, constantly messing with our most carefully made plans. 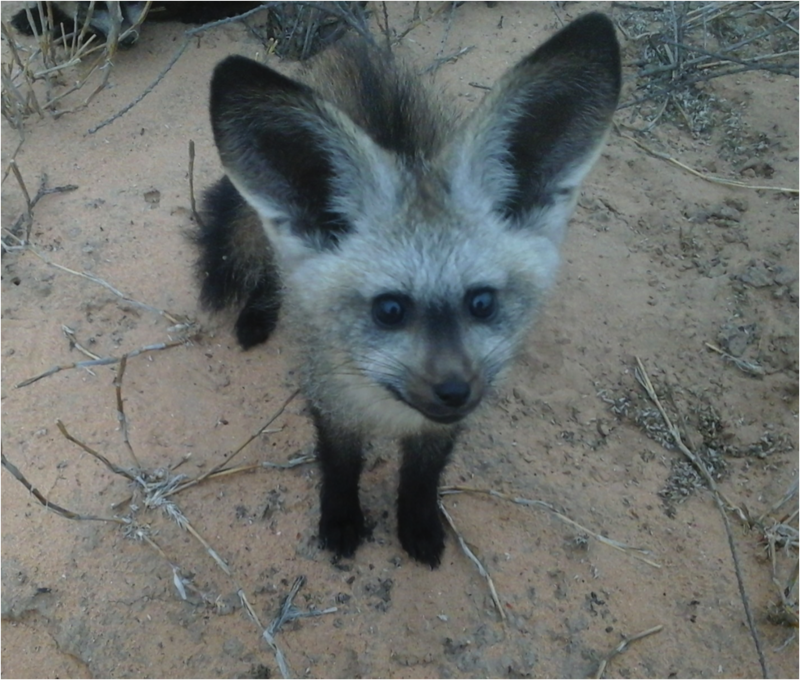 This entry was posted in bat-eared foxes, endocrinology, field biology, field work, foxes, Otocyon, Ruan de Bruin and tagged bat-eared fox, canids, ecology, Kalahari, maternal care, Otocyon, parenthood, paternal care, pups on January 30, 2015 by Ruan de Bruin. An experienced field researcher by now, I had certain expectations of my third trip to the field this year. These expectations were quickly shattered as I, once again, realised that change is the only constant. My body – used to subzero winter temperatures in the Kalahari – went into a mild state of shock when I returned to spring temperatures reaching 40°C. The heat is, quite simply, debilitating. Simple tasks like eating dinner become a battle as I try to force nutrition into my body that was already sweating like a hippo in a sauna. 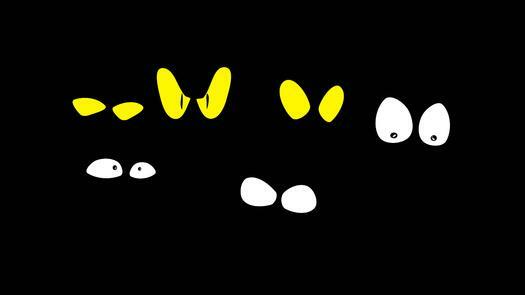 I have a new appreciation for nocturnal work under these conditions! The batties have shed their gloriously fashionable winter coats and their true size – or lack of it – is now revealed in their scraggly summer fur. They are almost half the size they were when I left. The lack of rain and extreme temperatures has also resulted in some vegetation changes. The tall sour grass that used to cause several “exciting evenings” is all gone and the field is now flat, open and bare. This makes finding the foxes a lot easier and these little Houdinis are far less likely to do a disappearing act on me this time around. 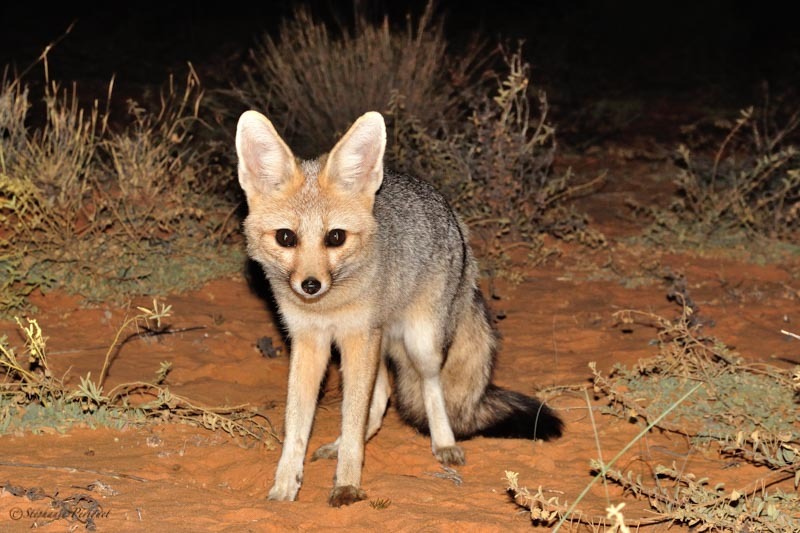 Last night, I had the opportunity to see a “dog” and mouse situation, where the fox I was following locked eyes with a passing rodent. What ensued was some tail-raised-dust-cloud acrobatics as Blackie was determined to put mouse on the menu. After several minutes of traversing in all directions, the battle finally ended in a faint squeak as the mouse was defeated. Blackie proudly looked around before he indulged in his glorious feast. 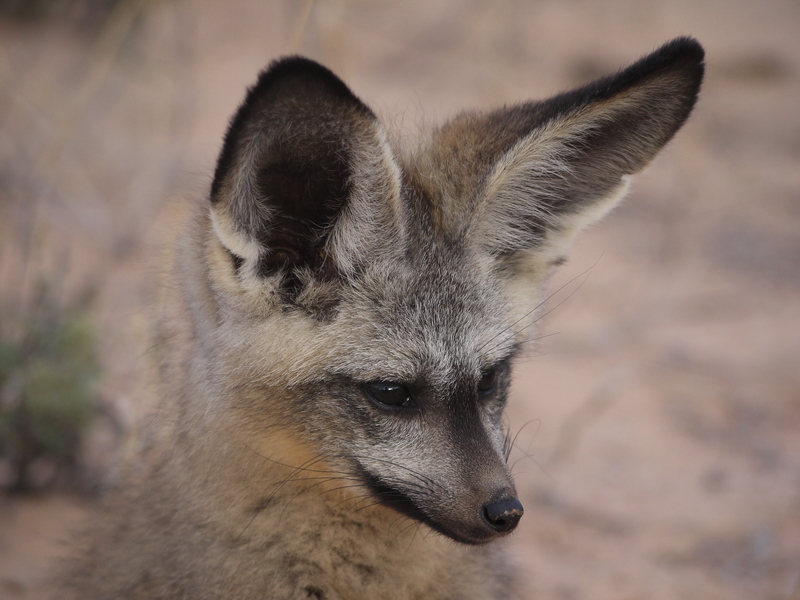 I am excited (and stressed) to be back with my foxes and anticipating that the breeding season is going to ensure me some interesting times in the near future… Hopefully some of these tiny little foxes will prove man enough to father some adorable pups. 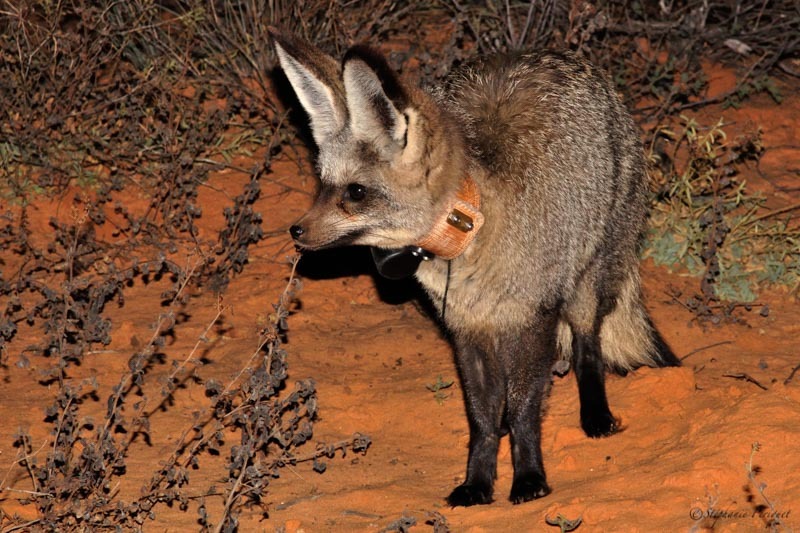 This entry was posted in bat-eared foxes, field biology, foxes, Kalahari, Otocyon, Ruan de Bruin and tagged bat-eared fox, canids, field biology, foxes, Kalahari, Otocyon on November 22, 2014 by Ruan de Bruin.